The biggest factors in attracting ducks to a certain area are food and refuge. Water levels that are slowly rising are continually exposing new food and often attract numerous waterfowl. Once you find these conditions, your next concern is how to hunt them. The duck boat system offers flexibility to hunt in many different situations. A first consideration of mine, when hunting a new area, is to be close to the center of the marsh. If you have had time to scout, of course it is best to go where the ducks want to be. The next considerations are wind, sun, water depth and surrounding vegetation. In most instances, I want the wind at my back, so ducks are coming straight at me for the easiest shot. If you have a sunny day with a north wind and set up with the wind at your back, you will be looking at the sun all day. On those days, I set up to hunt a cross wind. My favorite days are a south wind with sun. If the ducks are working well, it is the perfect opportunity to shoot a black duck (they're rare in my part of the country) or a banded duck, because you can see every detail when ducks are in range. If there is not much wind, you need to find a place where the decoys will catch the slightest breeze and create movement. Conversely, on windy days, you may want to find some sheltered area to set up. These situational rules are not hard and fast. Many days I have set out of the wind and watched ducks land in the chop in the open. Big open water lets decoys catch the slightest breeze. Surrounding vegetation is important as it relates to cover for the blind and open water to allow the decoys to move. When you find this situation together and it is oriented to predicted winds for the day, you have found a spot to hunt. Pay particular attention to your blind on cloudy days. I carry a machete in my boat to chop surrounding vegetation to supplement my blind. I also consider water depth when selecting a place to hunt. This is especially important when waterfowl are feeding in the area you are hunting. Optimum feeding water depth for mallards is less than 6 inches. If you are hunting flooded corn, of course the water level must be where the ducks can reach the ears. 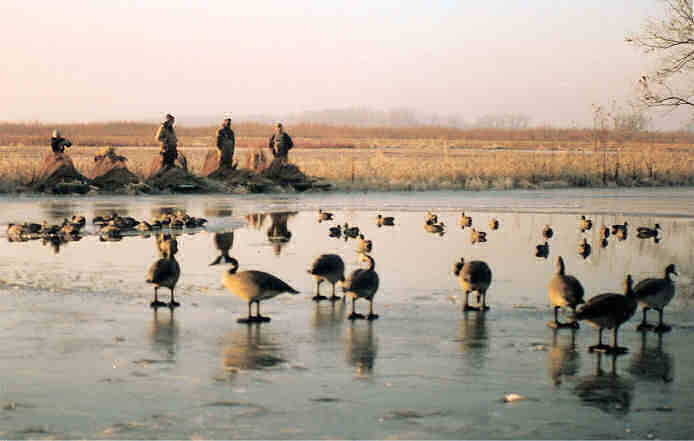 Now that you have found a place to hunt, you need to set out your decoys. An important advantage to using duck boats is that you don't have to get out of the boat to set your decoys. I start upwind and throw the blocks out as I drift. Every duck hunter has their own system and reasons for their set. My sets are simple, they are random. My only concession to outdoor writers and how-to books is to have an area with a light concentration of decoys where I want the ducks to land. The rest of the spread is random concentrations with most of the decoys in gun range. This is how you see ducks on the water. I generally use lots of decoys because I can. They are easy to carry in the boat. I may use a hundred decoys when hunting by myself. I hunt with buddies who have duck boats. We place the boats side by side so we can talk and pass food back and forth. In most instances the wind is at our back. Some adjustments are made so you don’t have to look directly into the sun. I think you blind better when the boats are together. If everyone shoots right handed, the boat on the immediate left should be 18 inches behind a boat on the right. This will allow the field of fire for the hunter on the right to extend across the nose of his neighbor's boat to the left. Put left handed shooters all the way to the right end. As in any hunting situation, you need to visualize your shots before you take them and evaluate their safety. P icking up the decoys can be accomplished without wading in the water. By poling upwind of the spread, you can turn the boat sideways and drift through. As decoys stack up against the boat, the boat slows down, allowing you to retrieve your blocks. This takes a little bit of practice, but is not difficult. Usually, I wait until I get to dry ground to bag decoys, because I will have some of my hunting partners decoys in my boat. The duck boat system is effective and comfortable. If you don't get in the water you won't get wet.